Lord Ganesha is one of the most extensively worshipped gods of the Hindus. He is considered as the god of beginnings, knowledge, wisdom, intellect, and eradicator of obstacles. Believed to be the offspring of Lord Shiva and Goddess Parvati, Lord Ganesha is worshipped at the outset of any auspicious event, rituals and even ceremonies for blessings and hassle-free work by the followers of Hinduism. Ganesh Chaturthi, dedicated to Lord Ganesha, is one of the most celebrated Hindu festivals. This ten-day festival starts on the fourth day of Hindu calendar month Bhadrapada, which usually falls in the months of August or September. Though the festival is observed in India and many other countries, Maharashtra – the Indian state – is known for its larger-than-life Ganesh Chaturthi celebrations. During the festival, colossal pandals (temporary shrines) are setup and the Lord is revered for ten days. Besides the pandals, people also install clay idols of Ganesha in their homes. The entire festival is marked by four main rituals, Pranapratishhtha – the practice of infusing the divine being into a murti or idol, Shhodashopachara – 16 forms of paying tribute to Lord Ganesha, Uttarpuja – a revering process after which the idol could be shifted, Ganpati Visarjan – immersion of the idol in the river. The observations consist of chanting of religious hymns and texts like Ganapati Upanishad, prayers and fasting. The offerings to the Lord typically include modaka (a sweet dish prepared using rice or flour, stuffed with grated jaggery, coconut and dry fruits) which is believed to be the favorite food of the elephant-headed deity, besides many other food preparations. After being offered to the Lord, the prasadam is distributed among the devotees. Exactly ten days after the starting day, on Anant Chaturdashi – the fourteenth day of Hindu month Bhadrapada, the idol is carried in a public procession with music and group chanting. All you can hear from far and near is Ganpati Bappa Morya, Mangal Moorti Morya which is actually sung to praise the Lord. And then, the idol is immersed in a close by river or ocean. With the belief that Lord Ganesha will eradicate all the problems and bring prosperity to their lives, people wish to bring the Lord next year once again. With the belief that Lord Vinayak will destroy all the troubles and bring prosperity in the life of everyone, Havells has garnered the courage to bring safety, security and strength (which all symbolize the power of the Lord) in the form of its technologically advanced wires. Wires, though unseen, make an important part of any building. So, for the complete safety, installing high quality wires like that of Havells make complete sense to secure your loved ones, appliances as well as building. Just like Lord Ganesha who protects us from all evils, Havells wires protect from all electrical hazards. 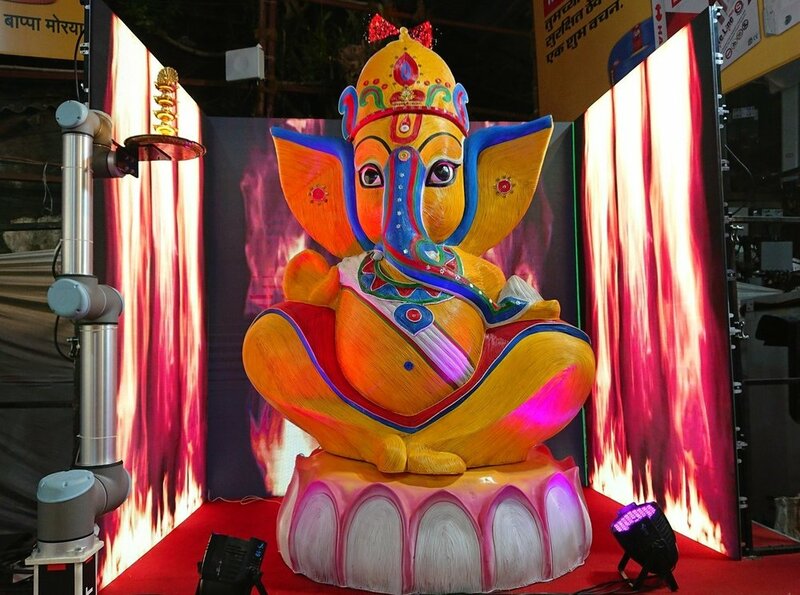 This year, at Lalbaug – the grandest arena for Ganesh Chaturthi celebrations in Mumbai, Havells has come up with a colossal structure of Lord Ganesha made of Havells wires (which represent strength and security) which will levitate in mid air, surrounded by virtual fire and lighting on screens (which depict the life’s troubles). And further showcasing the strength of the Lord in the form of wires and delivering the message that wires that don’t catch fire. During the entire program, people can send their offerings to Lord Ganesha by doing or promoting the acts of safety, security and strength online by using the hashtag #vighnavinashak, and their names would appear on the walls of fire surrounding the Lord, cutting through the fire. They can also form a chain of faith by tagging their other friends to do the same. If you happen to be there, you can see all the activity, yourself and other people engaged in the campaign through live 360 degree cameras all over. With the hope that Lord Ganesha brings happiness and success for all, Havells wishes a very Happy Ganesh Chaturthi to everyone!